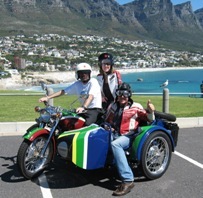 Cape Motorcycle Sidecar Tours Travel. 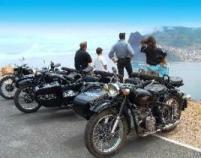 Cape Point Sunny Sidecar full day Xperience Tours. 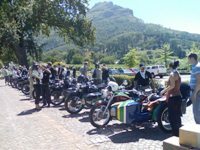 Cape Winelands Sidecar full day Xperience Tours. Your driver will head north-east from Cape Town city towards the beautiful country town of Stellenbosch. 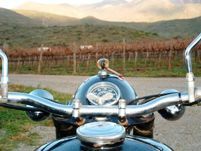 Take an adventure stroll through the historical town centre and then all aboard for a drive over the Helshoogte Mountain pass for wine tasting at one of the many wine estates along the route. Then on through to Pniel, passed Boschendal Wine Estate to Paarl for an optional lunch. More tasting at Seidelberg and a visit to a glass-blowing studio. Great views of Table Mountain on the way back. 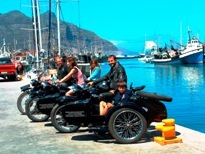 1 or 2 passengers per sidecar. Excludes meals, cost of wine tasting, driver's lunch and tips. from Sea Point, Cape Town. 9am - 5pm Chauffeured R2860 for 1 or 2 passengers. 4 hour Chauffeured transfers R2640 for 1 or 2 pass. 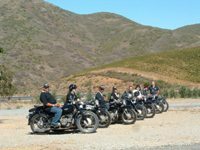 Overnight and Group Tours (20 bikes) are available. 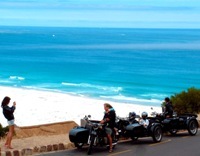 Explore and have fun visiting sunny Cape Town’s sites on an open-air, easy free, vintage bike: Cape Point Nature Reserve, Chapman’s Peak Drive, Penguin Beach, Whales in Hermanus, Great White Shark Diving and Viewing, Skydiving, Paragliding, Safari Parks, etc. Save hundreds in tour fees by going there yourself. Excludes tolls, entry fees to Boulders and Cape Point Nature Reserve, Excludes meals, refreshments, driver's lunch and tips.